Type the users name into the Real Name box marked by arrow A1. This is used in Webmail for the users From entry and for searching the directory. Type the users password into the CommuniGate Password box marked by arrow A2. Finally, click the update button marked by arrow A3. Type the new password for the user into the CommuniGate Password box marked by arrow A2. 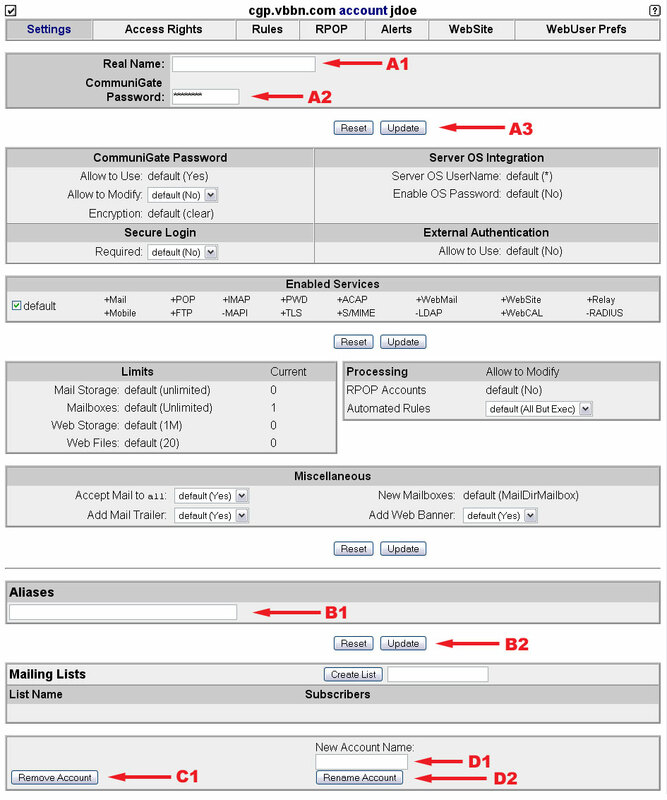 Aliases allow a user to receive email at a second address. For example adding the alias jane.doe to the user jdoe would allow email to be received at both jdoe@yourdomain.com and jane.doe@yourdomain.com. Type the alias to add for this account into the box marked by arrow B1. Then click the update button marked by arrow B2. Click on Remove Account button marked by arrow C1. You will be promtped to verify that you want to remove the account. Type the new name for the account in the box marked by arrow D1. Then click the Rename Account button marked by arrow D2.